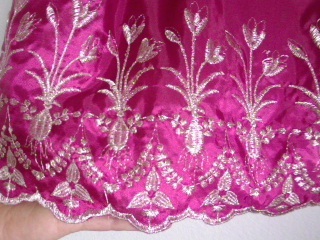 Yolanda at Pink Princess was amazing enough to send me this this GORGEOUS Fuchsia Metallic Embroidered Taffeta Dress with sash for my review. Let me just start off by saying..This picture does no justice on how BEAUTIFUL how this dress is in person. 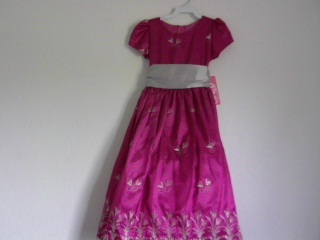 I have never seen a more beautiful childrens dress in my life! I spent awhile looking through Pink Princess's website and EVERYTHING is AMAZING! I couldn't help but Awe over the boys formal wear either! They are all wonderful! 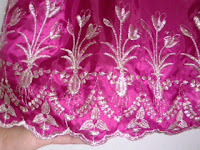 One thing besides the amazingly beautiful color of this dress was the cut of the bottom of the dress. It's pure modern princess for sure! 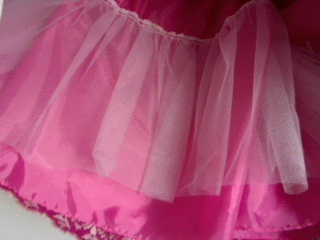 It reminds me of a modern Cinderella ballgown. 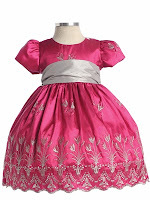 Any little girl would be happy to wear this amazing dress and wouldn't want to take it off! 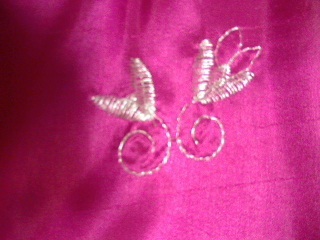 every stitch is amazingly sewed. All through out the dress you will see these amazing blooming flowers stitched onto the dress the color of the stitching really makes this dress POP with its beautiful shiny cream color stitching. You can tell that each stitch is perfectly placed and placed with love and care. They really make this dress stand out from all the rest. 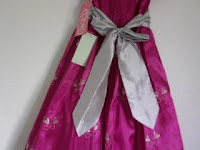 Attached to this beautiful dress is a wide silver sash that expands from the front and wraps around the waist to the back of the dress and ties into a neat and adorable bow, the sash is Irremovable so you can not remove it that's the only bad thing. Even tho it's irremovable it's cute enough your child will not want to remove it. There will be no tugging on the dress because of the sash, This dress is easy to move, run, and play in. The pink flower embroidered is in simple fact a wonderful summer time dress. 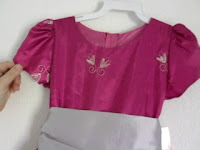 With the floral print finished using a bubble-cut design sleeves. this pink desire is sweet for just about every pink princess. With it's rounded neck cut you will not hearing your child fuss about the collar choking them or being to tight around their neck. 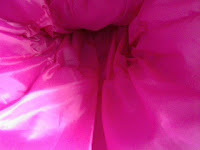 This dress is made of light fabric material so it won't get too hot, or weigh them down while playing. The length is perfect it stays above the ankle so there will be no tripping or falling while running around. Inside the dress you have 3 layers total but again, This fabric is light weight and very breathable so you won't have to worry about your child getting to hot while playing. Close to the bottom you have the stitching that goes all the around the dress that is sewed into the dress with the other fabrics that make the floating "Bell" design. 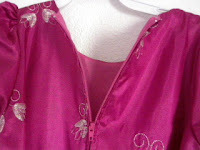 The outer layer you have the beautiful stitched fuchsia dress fabric, the second layer is the white mesh that is sewed from the front into the back that helps bloom or bell out the dress to make it have that princess cut to it, and also the third layer is thinner softer pink layer that seperates the other layer and the mesh from the dress. The back has a easy zip back for easy access, For fast removal and fast dressing. 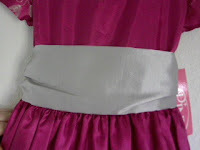 It's rich silver colored bow is a soft shimmer fabric that is easy to tie and easy to iron to get the wrinkles out of (Do not use high heat) the ribbon goes past the dress length so you can have a ordinary plain bow or you can do multiple bows, twist or anything your imagination brings you. ♥ I receive no monetary compensation for this review. I was provided a Pink Princess to try and give my honest opinion.